Hot summers and grilling are synonymous with backyard entertaining. Longer periods of sunlight and warmer temperatures make a summer backyard BBQ as American as apple pie. Tradition dictates that BBQs are all about grilling meat. Who doesn’t love a good piece of grilled chicken or a juicy hamburger? However, it is truly the quality of the side dishes that separates a decent BBQ from a memorable one. Nothing is a better side dish than dessert. However, a carton of ice cream doesn’t satisfy some eaters on a summer day, particularly if they are looking for a healthy and refreshing dessert option. Why not try mixing up your average dessert by returning to the grill with a couple of peaches and plums topped with a cool mascarpone topping? 1. Light a grill. In a medium saucepan, combine the sliced plums with 3/4 cup of the sugar and the water and bring to a boil. Cover and simmer over moderately low heat until the plums are very soft, about 10 minutes. Transfer the plums to a food processor and purée until smooth. Scrape the plum sauce into a bowl, stir in the lemon juice and set aside. 2. In a small bowl, stir the melted butter with the remaining 1/4-cup of sugar. 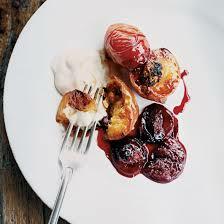 Grill the halved plums and peaches over moderate heat, turning once, until the fruit is tender, about 6 minutes. Baste the plums and peaches with the butter and continue to grill, turning once and basting again, until caramelized and slightly charred, about 2 minutes longer. 3. Transfer the grilled fruit to plates and spoon the plum sauce on top. Dollop the mascarpone alongside the fruit and serve. The plum sauce can be refrigerated for up to 2 days. Serve warm or at room temperature.